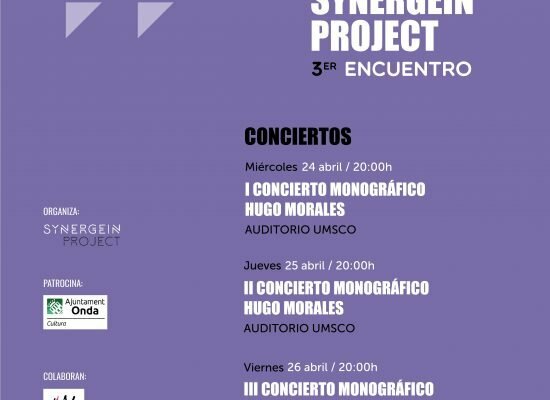 Synergein Project is a pedagogical-musical project that was born at the end of 2014 under the artistic direction of percussion musician Sisco Aparici and the composer and interpreter of electroacoustic music Vicent Gómez, joined in 2016 by percussionist Juanjo Llopico , three musicians with solid formation, a wide experience in the participation in national and international festivals of contemporary music and a necessity and intense passion for the knowledge, the creation, the pedagogy and the interpretation of the current music. The basis of this project is an open and flexible configuration that modulates and adapts to different artistic and pedagogical projects, both musical and interdisciplinary, open to experimentation and interaction with new technologies, and with the clear objective of generating new works, own or custom, that contribute new ways of expression and interpretation and contribute to enrich and spread the contemporary musical repertoire. Its main activity is to create synergies between its two types of proposals: the interpretive and the pedagogical. In the interpretive aspect, Synergein Project focuses both on the musical repertoire of the 20th and 21st centuries and its dissemination in concerts and National and International Festivals of Contemporary Music as well as in the experimentation and promotion of new interdisciplinary projects. His commitment to musical artistic creation is reflected in the large number of current composers who compose its repertoire, among others Pierluigi Billone, Brian Ferneyhough, Stefano Gervasoni, Toshio Hosokawa, Helmut. Lachenmann, Jose Manuel Lopez, Bruno Mantovani, Wolfgang Rihm, Alexander Schubert, Stefano Scaranni, Mauricio Sotelo, José Luis Torá, Aureliano Cattaneo, Pierre Jodlowski, Ramon Lazkano, Héctor Parra, Alberto Posadas, Marco Stroppa. 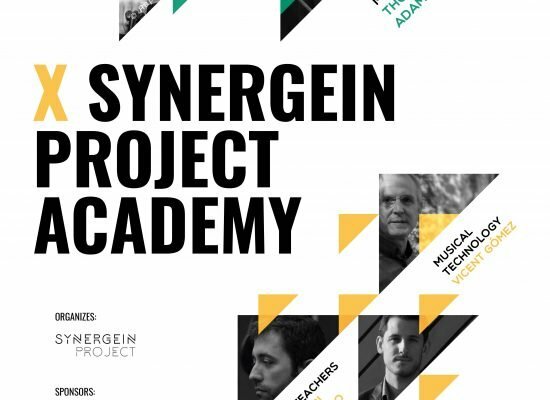 On the other hand, the Synergein Project Academy offers students of professional or superior degree of percussion an excellent framework to study the most current repertoire, both acoustic and electro-acoustic, with world-class teachers and percussionists such as Christian Dierstein, Jean Geoffroy, Sisco Aparici, etc. Complete and practical classes with music technology workshops, conferences and concerts. Synergein Project is the new artistic project of the TDM Association Trio of Magic. This association has been selected by the Ministry of Foreign Affairs and International Cooperation for Development (AECID) as Representatives of Spanish Culture Abroad in 2012 and 2013, and has been repeatedly awarded by the prestigious foundation "Ernst von Siemens" for its work of pedagogical diffusion through the International Academy TDM and the Young Composers Convocatory.